Last season, we conducted the first year of a two-year survey to identify the most common weed species encountered in Missouri corn and soybean fields, and also to better understand the management practices that producers utilize for the control of these species. This survey was primarily conducted throughout the northern half of the state across 50 different locations in 2011, and will be conducted in even more locations throughout the state in 2012. In a previous article, we described our results pertaining to the most common weeds that we found in Missouri corn and soybean fields in 2011. In this article, we will explain our findings as it relates to some of the management practices that producers utilize in Missouri soybean production systems. As one component of this survey, we used the WeedSOFT computer program to estimate soybean yield loss based on the weed species and density of weeds present in each field just prior to the time of the post-emergence herbicide application. WeedSOFT is a program developed by a number of weed scientists at universities throughout the U.S., and is available online free of charge. To use this tool for yourself, simply go to www.weedsoft.org and click on the yield loss calculator. Once there, all you have to do is enter the size and density of weed species in your field, and you will be able to see the yield loss that may have already occurred in your fields, or the weed loss that will occur if you delay your post-emergence herbicide application to subsequent soybean growth stages. Figure 1. Estimated soybean yield losses incurred by the time of the first post-emergence herbicide application in the 2011 Missouri survey locations. The dashed red line indicates the average yield loss incurred across all surveyed locations. Labels next to each bar indicate the soybean growth stage at which the post-emergence herbicide application was made. As illustrated in Figure 1, based on the weed species and densities present at the time of the post-emergence herbicide applications, we estimated that soybean yield losses ranged from 0 to 7.4 Bu/Acre at the 2011 survey locations. 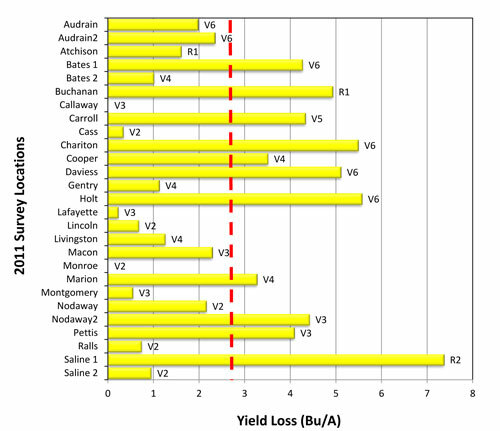 Also, across all the survey locations we were able to determine that the average soybean yield loss incurred as a result of waiting too long to make post-emergence herbicide applications was 2.7 Bu/Acre (Figure 1). The point of this data is simple; it illustrates that in many Missouri soybean fields we are losing yield as a result of early-season weed competition and waiting too long to make our post-emergence herbicide applications. One of the fundamental principles of weed science is that the more weeds there are and the bigger these weeds get, the more yield loss we will experience. To some extent, this principle is also illustrated in the results from last year's survey contained in Figure 1. Although this figure does not show the weed density at each location, it does show the time that the post-emergence herbicide applications were made. For the most part, herbicide applications made to soybeans in the later stages of growth resulted in higher yield loss than those made at earlier stages of growth. So, as you consider the timing of your post-emergence herbicide application in soybean this season, consider the price of a bushel of soybeans and what a 2 or even 3 Bu/Acre yield loss means to you. There are plenty of companies promoting various practices that will "enhance" yield by 2 or 3 Bu/Acre; our data indicate that in many Missouri soybean fields, we may be losing this much yield to weed competition.